Unlike some of the other laptop bags in Laptop Bag Review Week, The Tumi Alpha T-Pass is one of a kind. At a glance, the price of the Alpha Tumi T-Pass may seem unreasonable, but the superiority of this particular bag outweighs the price. This bag proves to be a vital item in any traveler’s tool belt. Some may argue against the diminutive size of the T-Pass; however, it compels you to carry less, resulting in a much lighter bag. From the start, the quality of the T-Pass is unparalleled. On the label, for example, the T-Pass proclaims itself as a travel bag. The label is correct; progressing through the airport security was a breeze with the T-Pass. Like most in the twenty-first century, I carry my laptop as I travel. With the T-Pass, I was able to unzip my bag, place the T-Pass on the carrier and gracefully walked through security. Never again will you painstakingly fumble with your laptop along with the countless number of items in your pockets. Different from other bags in Laptop Bag Review Week, the Tumi T-Pass possesses a special feature called Tumi Tracer. After registering your bag on the Tumi site, if an individual recovers your bag and calls Tumi, Tumi will work to make sure you receive the bag back. The stereotypical Mac crowd carries a more youthful looking bag with bright colors and clean lines. 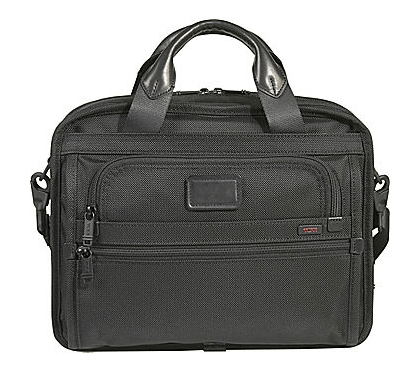 The model we tested is a more traditional Tumi signature style ballistic nylon in black. Recognize, however, that Tumi does offer backpacks and messengers with cleaner lines and are now beginning to introduce brighter colors. Just as Apple encourages people to “think differently,” you should reconsider Tumi as your next bag. The Tumi T-Pass sports one main compartment with a few companions. One of the main compartments in the T-Pass is for your laptop. Since this version of the T-Pass is a small screen version, it does not support laptops larger than 15”, so if you possesses a larger laptop, consider the medium screen version. I feel immensely comfortable when storing my 13” MacBook Pro in the compartment as it fits snug. Adjacent from the laptop compartment, the T-Pass has a file holder and pocket to store miscellaneous items. When you are purchasing a Tumi, the quality is evident. The importance of the quality when purchasing a laptop bag proves unquestionable. The team rigorously tested this bag and the zippers and stitching maintained their integrity. There’s nothing worse than having a bag failure while traveling. The lightness of the bag is deceiving, as the review team was impressed with the sturdiness of both the zippers and handles. Although Tumi has done a terrific job at creating a lightweight travelers compaign, they seem to have neglected to understand the need to carry accessories. Yes, Tumi provided a bag that can fit charger, cables, etc, but it is a loose appendage that floats in the bag and makes the computer compartment challenging to zip. I recommend that Tumi rethink how they enable carrying accessories. Hands down, the Tumi T-Pass Small Screen is the highest quality, best lightweight bag that the review team carried. Granted, the price is higher than the rest, its value is evident. This is my bag of choice! As mentioned, we do recommend that Tumi provide a better option for accessories. Have the Alpha Tumi T-Pass Small Screen, what do you think, leave a comment! Heya…my very first comment on your site. ,I have been reading your blog for a while and thought I would completely pop in and drop a friendly note. . It is great stuff indeed. I also wanted to ask..is there a way to subscribe to your site via email? 5. A Sony Point and Shoot Camera in its case and additional accessories. that can carry a small laptop or an ipad… I came close to buying this one but definitely the Alpha was far superior in convenience, sturdiness and space. I agree, the Tumi Alpha T-Pass’ convenience is far superior.